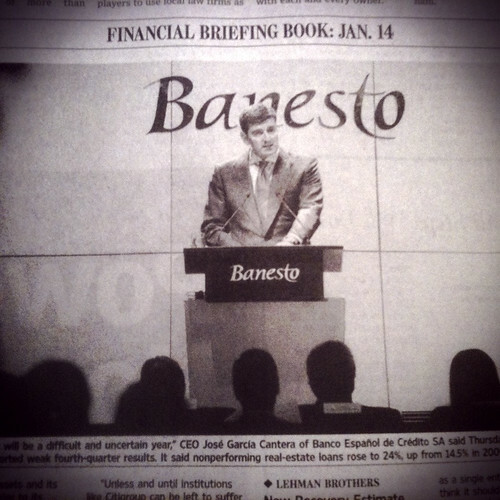 ‘PAIN IN SPAIN: ‘It will be a difficult and uncertain year,’ CEO Jose Garcia Cantera of Banco Espanol de Credito SA said on Thursday, when the Spanish lender reported weak fourth quarter results. It said nonperforming real estate loans rose to 24%, [emphasis added] up from 14.5% in 2009.’ – Wall Street Journal, 1/14/11, page C2. 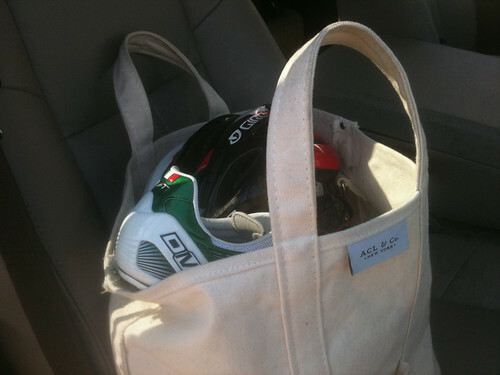 – If you’re a bike racer, by default you’re a connoisseur of travel bags. Shapely compartments, hidden pockets galore to indulge your inner Get Smart, wet gear quarantine, luxe zippers, etc, etc is only the start to our bike-specific needs — something we’ve already attacked head-on in what turned out to be a stellar collaboration with Capo. Yet there’s an alternative approach. It’s no less stylish, but its virtue is its simplicity. Say hello to the Dandux canvas tote, done up by ‘A Continuous Lean’ — an essential blogger and Solicitor General of a saltier and more achievable sense of style than what’s put forth by the GQ set. – You need a travel bag to…travel. Do you get chills at those two simple words – ‘spring classics’? If so, on your very short list of destinations is the pilgrimage to the hallowed roads of Belgium. Critical skills for the trip? Learning how to cope with the beating of the cobbles; learning how to gauge your intake of what you’ll find to be an entirely different concept of beer; and — apropos to what you see below — learning to be culturally attuned in a land whose disunion is all-too-real. Do yourself a favor and track down a copy of the January 10, 2011 New Yorker (or buy the article here.) 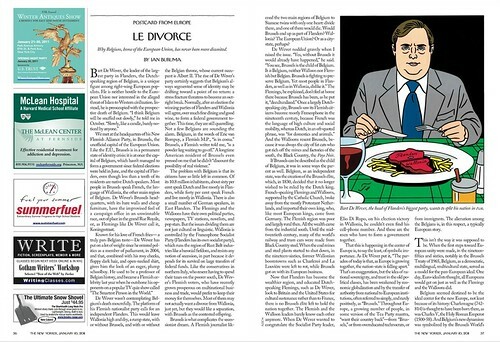 Ian Buruma’s piece ‘Le Divorce’ is a classic, and even though it has nothing to do with Belgium’s bike racing culture, in fact it has everything to do with it. – Headbadges: From Here to Eternity. 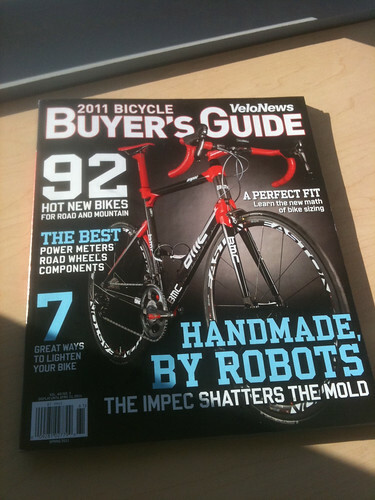 – VeloNews puts their best foot forward in their most recent issue, their ‘Buyer’s Guide.’ They have some faintly interesting articles about the product warranty process and about the materials that make up our bike stuff, e.g. oil, rubber, carbon, aluminum, etc. The trouble, though, is that it’s almost impossible to make it past the cover. In a mind-boggling act of editing (or is it non-editing? ), the bards of Boulder plaster the cover with a photo of the BMC Impec, and the headline they use is BMC’s own marketing tagline for the Impec — ‘Handmade by Robots’. How do you spell ‘verbatim?’ This phrase — along with the variant ‘Handmade by Machines’ — was front & center in 400 point font at BMC’s huge booths at Eurobike then Interbike. It’s omnipresent in BMC’s online and print ads all over planet Earth, and its prominence is no less gargantuan on their website. Yes, it’s a big win for BMC and bully to them for that. But more memorable is this regurgitation’s lack of judgment, oversight, journalistic integrity, and so much more. VeloNews, what were you thinking? – Branded content: It’s a significant part of the future (and present, really) of high-dollar marketing. Cervelo set the bar high for the bike biz with their 2 year commitment to ‘Beyond the Peloton’. The auteur value is high, and the forced & uncomfortable moments of extolling-the-product are blessedly rare. Perhaps the greatest tragedy of the loss of the Test Team will be the possible loss of funds for more of the same in 2011. Given the ever-escalating cold war of branding between Cervelo and Specialized, it’s reasonable to think that the Big S would zero in on ‘Beyond the Peloton’, and in analyzing it they’d recognize how much of its accomplishment is a function of its subtlety. But if you sit through the recently-released Specialized video ‘The Countdown with Todd Wells’, you’ll see subtlety getting as much airtime as a Trek Madone. Specialized has awesome material to work with. Todd Wells is probably the most humble, most likable bike racing American pro there is. And as a rule Specialized riders tend to win a whole lot. Yet even with those advantages, this video is a gag-fest. It’s not branded content — it’s video waterboarding. How many soft focus S logos can you film in 5 minutes? Get out your clicker then fire up the video, because you’ll get the answer. The Countdown with Todd Wells from Jim Fryer/BrakeThrough Media on Vimeo. – This is found art, perhaps the best kind: English is not his first language. His verbal clarity seems further impaired by his anger regarding his allegedly defective Specialized. His renderings, though, are multimedia majesty, and if reproduced in ample size and richness of color, they’d deserve a spot in the Whitney Biennial. – Easton Bell Sports is all over the bike industry — they make Easton components, Giro helmets and shoes, Bell helmets, Blackburn accessories and a whole lot more. It’s easy to assume that bike, though, is pocket change to them in comparison to their ball sport revenue. Their marquee ball sport brand might be Riddell football helmets. In reading this article, it’s easy to play out a doomsday scenario where Easton Bell bike goods get more expensive thanks to the price paid to soothe the ostensibly pro-consumer ravings of a congressman with a lack of an authentically pressing agenda. Equally high on the misery-hilarity index is what appears as result #1 when you search ‘Riddell’ on the nytimes.com search engine. – This video didn’t seem to make the rounds after Laurent Fignon died a few months ago. It’s heartbreaking for the way it gives witness to the whimpering end of a superstar’s career; and in the singularity of the vibe it gives off — finality — it’s eerie in the afterglow of his passing.